Hello Block Party Friends & Welcome February! Dan just got back home from "Road To California" last week, we had an AWESOME show!! Thanks to our faithful followers who were patient enough to hunt for our booth again this year!! Thank you, Thank you, Thank YOU!! Next stop, Hampton, Virginia! 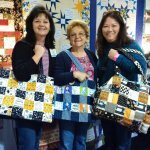 We're looking forward to heading back east again to the "Mid-Atlantic Quilt Festival". If you are around, it will definitely be well worth your time to attend! Come say HI to Dani in booth #1802! 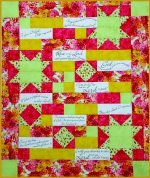 Check out our new "Dear Daughter" kits, we now have three kit fabric choices to choose from. One of them is sure to suit that beautiful daughter of yours! 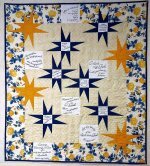 We have new fabrics for our "Comfort of Psalms" and "Guiding Stars" kits for sale. They are simply breathtaking !! Check out this digitally printed fabric from Hoffman. We haven't decided what to do with it yet, but we knew you would love to see it. The colors are amazing! 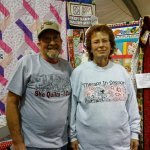 Thanks for letting us share our love of quilting with you!